A last minute entry for the Cas-ual Firdays Sticker Challenge! I suddenly had this card come to me for the challenge. I remembered stickers that I bought on sale and never used them. Well, now I have! Woohoo! I also for some reason had Halloween on my mind! I choose not to put a greeting of any type because I just thought the card said it all. The 'leaves' are black stickers and the skull is a sticker too. The only thing I stamped on was a few bats. 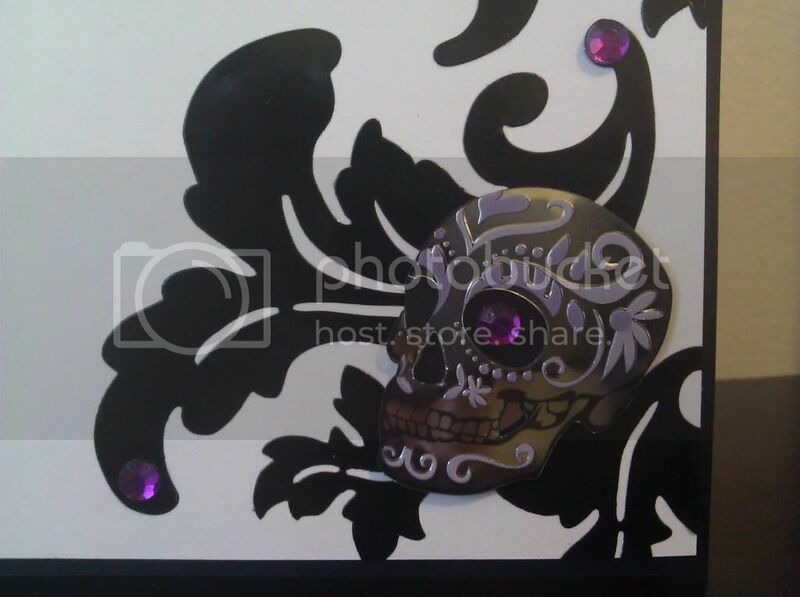 I also added some purple jewels that came with the skull sticker. So this is just a little thank you card I made. I'm a little 'iffy' on this one...I don't know why? I guess not everything's always explainable. 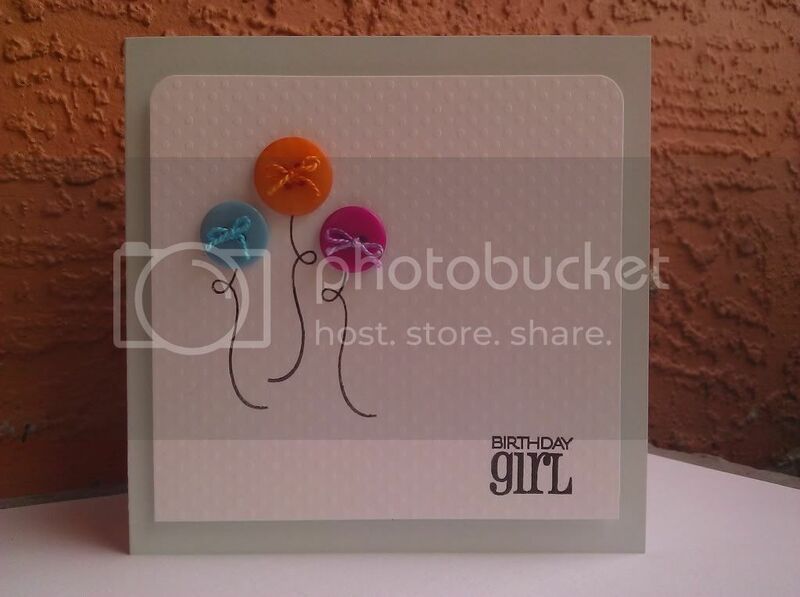 Supplies: cardstock (in a light blue), white paper (bazzill dotted swiss), balloon strings and birthday girl stamp (verve birthday bash), colored floss, buttons, black ink (colorbox) and corner punch (rounded). Greeting's everyone! This is just a quick little card I made for a friends birthday. I needed to do something that was quick and easy considering their birthday is tomorrow!! I used a clear stamp I had for quiet sometime now, actually from the dollar bin at the craft store! I filled my glasses in with a gel pen and added gold pearls to some of the bubbles. Greetings everyone! Today I share this special card I made for one of my best friends ever!! I wish that today could be a better day, not only for her but myself and others as well. Exactly one year ago today, my friend lost her husband to cancer. It was very hard on her (still is at times) and others as well. Being we live about 3,000 miles away from one another, I figured the best way to let her know I'm here for her, was to make her an extra special card. I always put my love into making cards but I had to add a little extra 'heart' into this one. I want her to feel what I'm feeling and I know she will. I know from above he will too. He will forever be a friend of mine and never forgotten. Hi everyone! 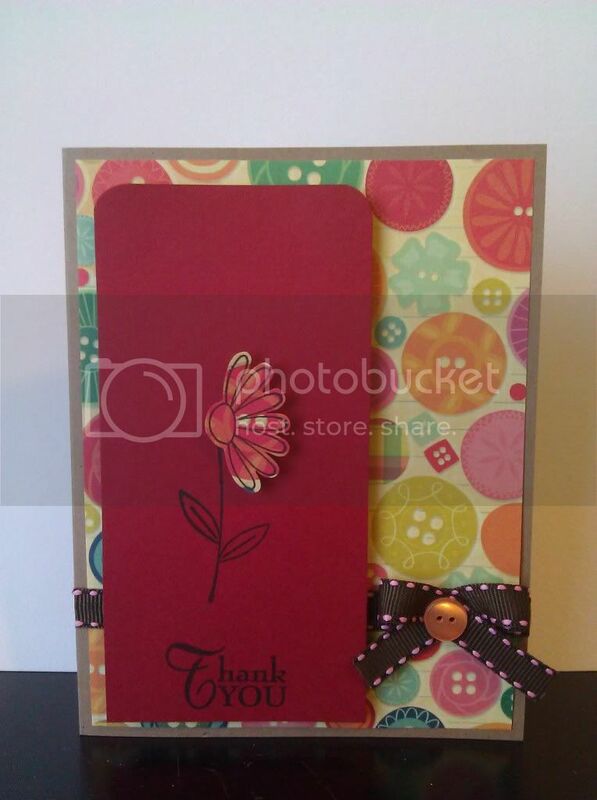 I am just so in 'WOW' of this card I made! I had another idea of mine in my head and I wasn't sure if it would come together. I could see the vision of it in my head but sometimes when you try it on paper it doesn't always go as planned. In this case it sure did! It's really not that hard of a card to do. I took a black piece of cardstock and layed my template over it. 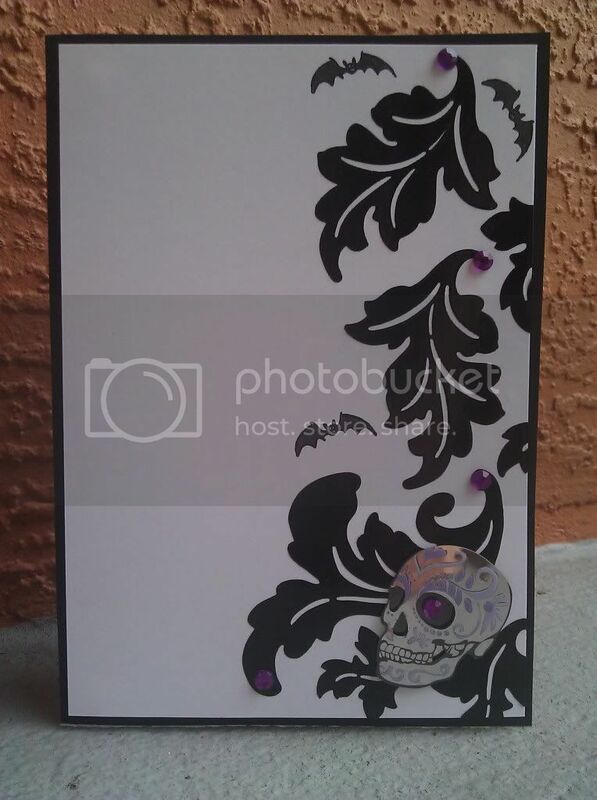 For my template I actually used a 12x12 piece of cardstock paper (creative imaginations-samantha walker). I then used 'perfect pearls' (by ranger) in colors forever blue and forever violet. To set the color in place and as well to make the colors bolder I used an adhesive (any stamp/glue pad for powders will do). Put the adhesive down first before the perfect pearls :) After adding the colors how I wanted them, I removed my template and lightly tapped off any excess powder. I them stamped on my quote (stamp by impression obsession). The ink I chose to use was 'frost white' (colorbox). I came up with this very simple card. I wanted to try something a little different and so I went for a 'white washed' look. I kept everything white except for my flower stems and my greeting. 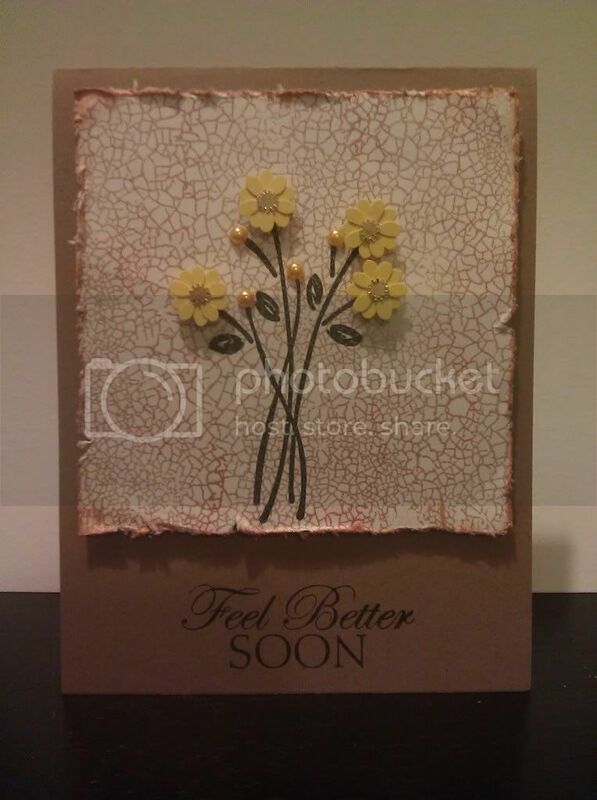 I embossed on the flowers and used brads in the centers. Greetings everyone! 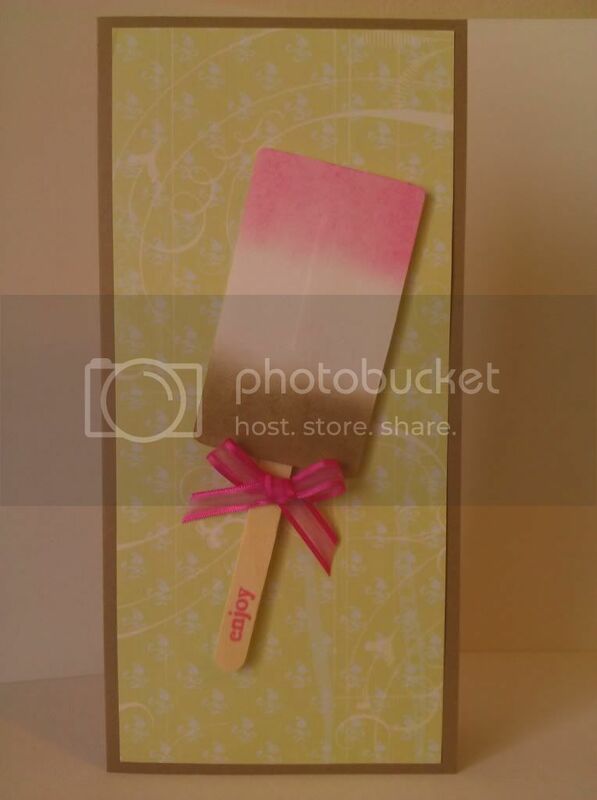 This is just a little sweet summer card I decided to make before moving on to the cooler months. Not that its getting any cooler here. :) So while its still nice and hot out, why not cool down with ice cream?! I came up with this card when I was browsing through a soap making book I have. I thought it was just too cute and perfect for a card. I had to figure out though how I was going to make it. It took some thinking, figuring out what paper to use right down to if I ink, chalk, etc. Well, I think I figured it out! For the ice cream I used a heavier weight paper and textured as well. I also embossed a line in the middle, so it wouldn't look flat. For the flavors I used chalk, I wanted to go for a somewhat softer look then ink and wanted to be able to blend them smoothly into one another. I added my stick and ribbon. Then stamped on 'Enjoy'. Hey everyone, here is another wonderful card I made for 'baby'. I kept it very simple and used unisex colors. I couldn't remember if she was having a boy or a girl...rather than making a fool out of myself, I went the 'it can be boy/girl' card. 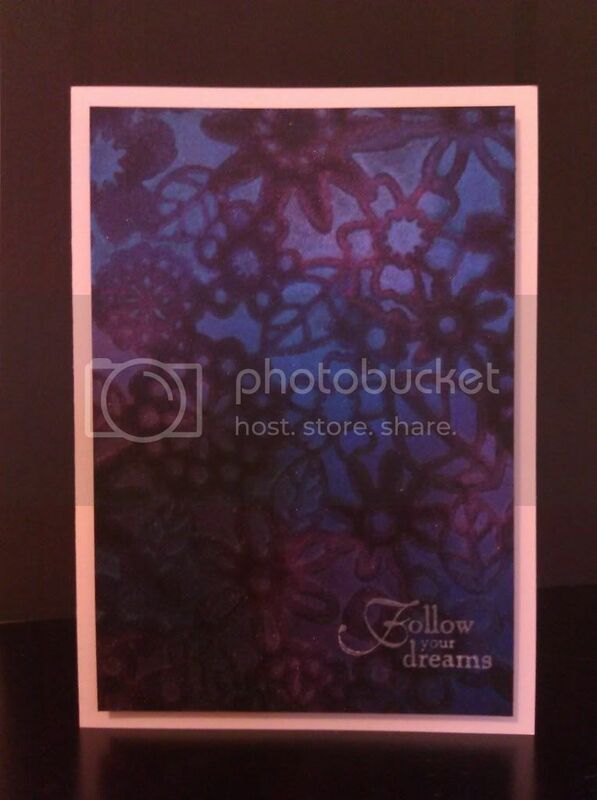 I used a white cardstock and embossed little bubbles on it. 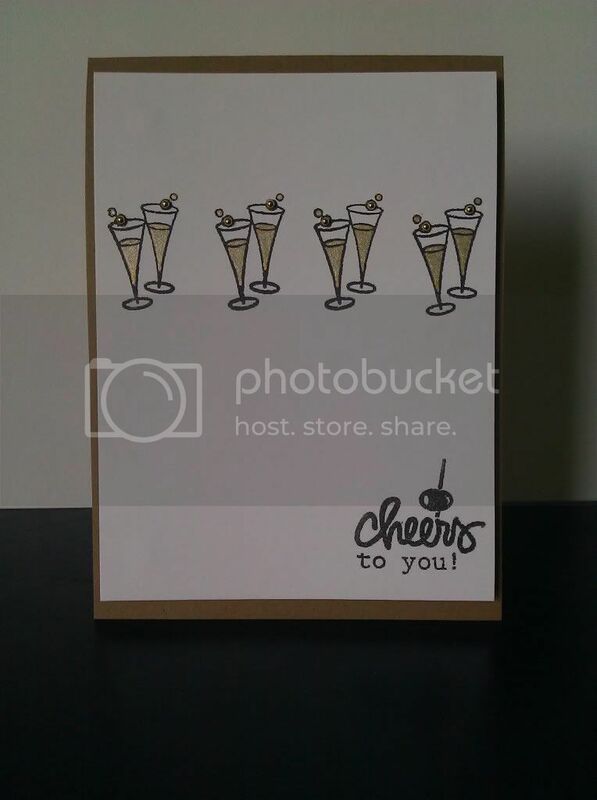 I did the bubbles the 'old fashion' way (to some maybe), I used a embossing template and a handheld embossing tool. My hand did start to cramp up on me! But it was worth it. I stamped on my saying and my little duck. Which the duck I stamped again on to white cardstock. Cut it out and gave it a foam square on the back and put it over my other stamped duck. 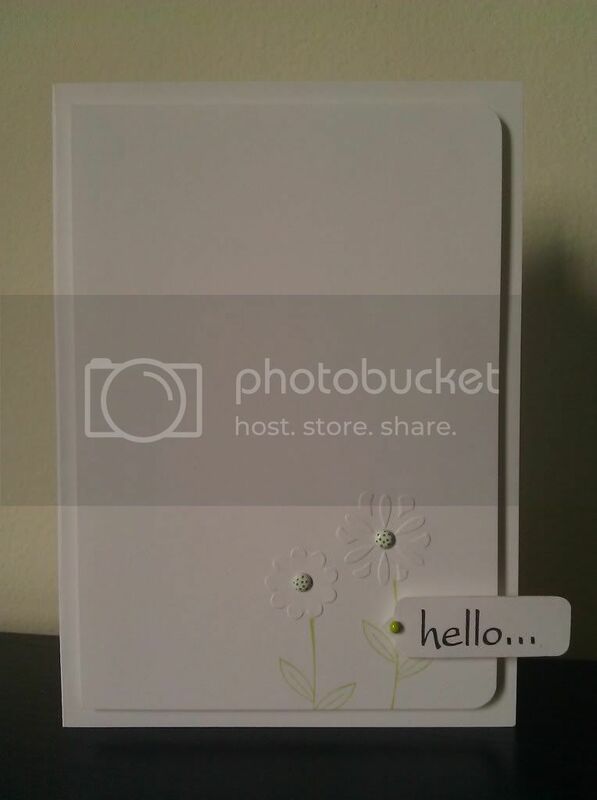 Supplies: white cardstock, green paper (ek success), embossing template (fiskars), embossing tool (fiskars), inks (black & mint both by colorbox), stamps (older clear stamps I had, any of your choice will do). Well to start things off, let's just say this was one of the hardest cards to take a picture of! I tried a number of different areas in my house, lighting, camera settings, etc. It was just a pain, I used a yellow pearlescent paper on my card and I can bet you that probably didn't do me justice. Besides all of that, I made a wonderful card to share with you all! How I thought of making this card, I don't really know. It just sort of came to me in my head. For the main star, I traced (using a reg pencil) a star template I have. This gave my a outline on where I needed to put my eyelets at. Once I punched all my holes out, I erased my lines. I used a white vinyl pencil eraser, I love it because it doesn't ruin the paper and it even will erase other things besides just pencil. Okay, back to the card now. After doing all that I set my eyelets in place. I then added a few silver star 'brads'. Now for my 'quote' I stamped it on the yellow pearlescent paper I had. After stamping it, I used a label template I had to trace around my quote, then cut it out. I did use little foam squares on the back of my 'star' paper and on the back of my quote. I am showing the same card twice because of the lighting issues and I really can't say which one I think looks better. Supplies: white cardstock, yellow pearlescent paper, black paper, yellow eyelets, silver star brads, star template (hot off the press), label template (hot off the press), ink (black by colorbox), stamp (practicing creativity designs), foam squares. Greetings to you all, I hope everyone is having a great week so far! This is my last card I made for the Cas-ual Friday Challenge. Once again I started going through my stuff and came across some flowers that I've only used once, I just knew I had to use them! This card was very quick and easy. I used some kraft paper (4x9) and I cut a circle out in the middle of the card (I used a circle template & circle cutter). For my flower I layered three different ones together and added the stamen's to the center. I then added my pearl design, which I used a template for. Last but not least I stamped my 'saying' on. Supplies: kraft paper, flowers/stamen (prima), pearls (recollections), ink (black by colorbox), stamp (lawn fawn), circle template/cutter (fiskers), pearl design template (swirly doodles by hot of the press).